For that special man in your life, also makes a great travel pack. See more info. Our handmade moisturising shaving soap is suitable for all skin types will also assist those men with problem or sensitive skin. The great mix of essential oils leaves the skin soft, smooth and with a beautiful aroma. Using only the best organic coconut, sustainable plamtation organic palm oil and cold-pressed olive oil, along with organic jojoba oil to give extra moisturising; this is a delicate but high lathering soap to assist in the shaving process. Soothing the skin, reducing any redness while giving your face a smooth, close shave every time, and the perfume is amazing. Packaged in a great travel container makes it an easy companion to go with you anywhere. Aftershave, This masculine aroma with its deep woody note and antiseptic properties makes this the perfect after shaving spray, to soothe and heal sensitive or damaged skin, giving you a refreshing start to the day. Team this with Essential Balm moisturiser, formulated with stronger essential oils for the purpose of healing damage skin. It has been very successful for reducing general rashes, shaving rash and other skin irritations. 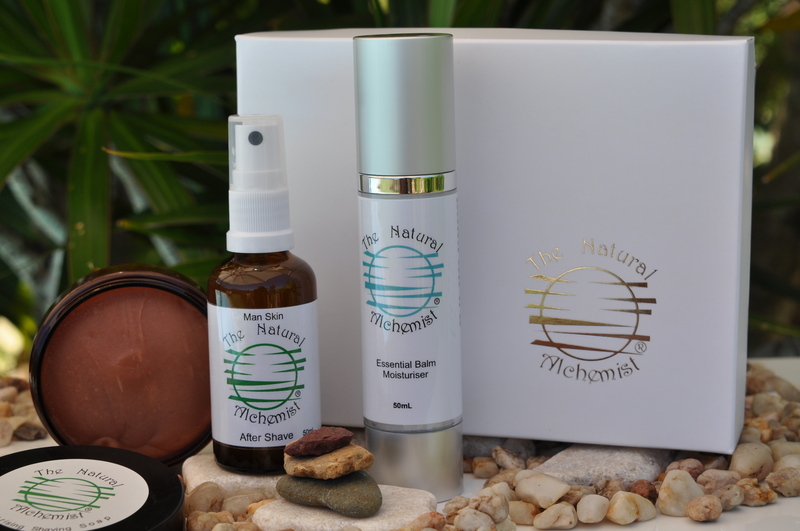 Leaving your skin feeling smooth while restoring it to good health. Soap- Organic coconut, Sustainable plamtation organic palm oil and castor oil, lye, distilled water, patchouli, cedarwood, bay laural, grapefruit seed extract. Please Note: Sustainable plamtation organic palm oil comes from South America, Orangutan DO NOT live in South America. Aftershave: Organic neroli hydrosol, witch hazel, cedarwood, cypress, juniper, petitgrain. Essential balm moisturiser: Aqua(purified water), organic prunus amygdalus dulcis (sweet almond oil), organic coconut, coco-caprylate caprate (natural ester & coconut), glycerin (vegetable derived), xanthan gum, cetearyl alcohol, cetearyl olivate(olive oil derived), dermorganics 1388 (glycerin, aqua, sodium levulinate, sodium anisate), tocopherol (vitamin e), jojoba, tamanu oil, Calendula, rose maroc, sandalwood, roman & german chamomile, lavender, carrot, rosehip, myrrh, rose absolute. These beautiful products are elegantly packaged in a matt white box with understated silver logo, conveniently ready for all gift occasions.